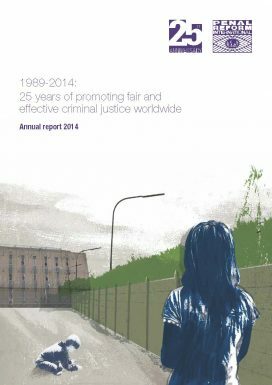 PRI’s Annual Report 2014 highlights achievements at both international and country level in our 25th anniversary year which ran from April 2014 to April 2015. The process of revising the text of the United Nations Standard Minimum Rules for the Treatment of Prisoners was completed in April 2014 at the fourth intergovernmental expert group meeting (IEGM) in Cape Town. A number of PRI recommendations were included in the new text, including the inclusion of a new provision to regulate the use of searches in places of detention. PRI strengthened its links with UN peacekeeping operations, providing training courses on the UN Bangkok Rules on women prisoners for two cohorts of future UN correction officers prior to their deployment. The Bangkok Rules and gender-sensitive prison management will now be a permanent module in this training course. Two new inspection mechanisms carried out their first year of monitoring visits: the National Preventive Mechanism of Kazakhstan which PRI helped to establish; and the inspection team for children’s care centres in Jordan, also established with PRI support. A new Children’s Act was passed in Jordan in July which raised the age of criminal responsibility and introduced restorative measures designed to keep children out of the justice system. PRI was influential in ensuring in particular that alternative measures to detention were included – and in 2014 provided training on the new law’s provisions for judges, prosecutors, lawyers and prison administration staff. In Kazakhstan and Kyrgyzstan, reviews of the current criminal legislation came to an end and entered into force in January 2015. In both countries, the new codes laid the foundations for expanded probation services to monitor offenders on non-custodial sentences and promote their reintegration back into society. For more information about these and more, please download a copy of the report below. Report of the PRI Board and financial statements for the year ended 31 December 2014.